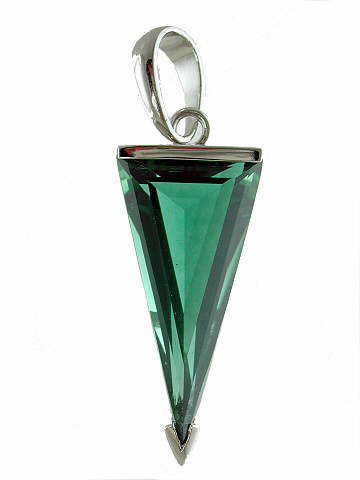 Exquisite faceted geometric design Siberian Green Quartz pendant. This is a speciality quartz, which is lab-grown. Genuine Siberian Quartz crystals are collected and then grown in controlled conditions in a laboratory and infused with copper, which gives them their lovely deep green colour. This process produces a completely flawless and pure Quartz. Metaphysically, these stones are said to be powerful carriers of the Green (5th) Ray, which is related to the heart chakra. Archangel Raphael is Master of the 5th Ray - the Emerald Green Flame, and his twin flame is Mary, Mother of Christ. The keywords associated with this ray are: Healing, Wholeness, Vision, Truth, Rhythm and Abundance on Earth. Alongside Archangel Raphael, we have Hilarion , the Ascended Master of the 5th Ray. Archangel Raphael exemplifies the qualities of the Emerald Green Ray; he was charged with being God's healer - healing of all kinds - earth healing, self healing and healing of mankind as a whole. His energies promote truth in all thoughts, deeds and actions, and the desire to manifest abundance for all, so banishing desire, need and impoverished states of mind, body and spirit. A perfect pendant which embodies the qualities of unconditional love and general healing. ‘Siberian’ is a gemology term often applied to gemstones of a flawless nature and of the and highest AAA grade.